More than 2 decades have passed since the first version of the “Pooya core system for International Banking Affairs” was generated. 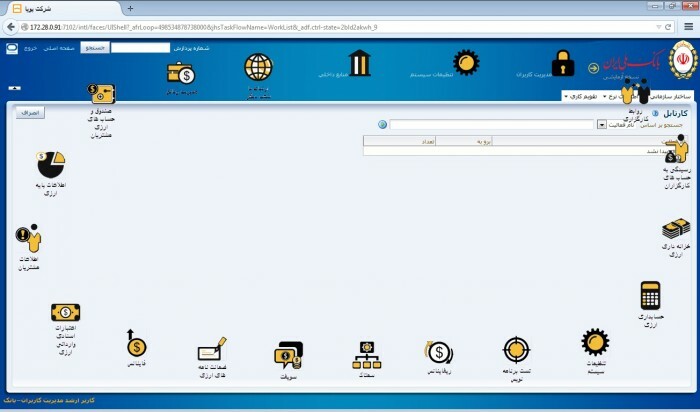 The system covers all common foreign currency processes of the operational units (branches, dependant or independent foreign currency affair units), as well as covering the foreign currency processes of the Iranian International banking affairs offices while meeting the requirements of the Central Bank of Iran. In its evolutionary development, the system has been able to comply with the latest banking requirements in the business process phase, by using the knowledge of banking experts. Also considering the technical aspect, the system has grown, using research and development and new IT outcomes. Today the largest Iranian banks are utilizing this system for their foreign affairs. An entirely professional software system for foreign currency affairs, is needed to respond to the mentioned features. This system should be comprehensive in responding to all banking needs in addition to being flexible and up to date with today’s technology. Withdrawing from client banking accounts during the day in the local currency for the provided foreign currency services and sending (transferring) the summary of the foreign currency operations to the General Ledger system at the end of the day to keep the bank book keeping functions integrated. Consisting of several subsystems based on the task separation in the foreign currency sections of banks. Defining many calculating items parametrically; such as tariffs, coefficients, etc. If for any reason banks do not want to use all the subsystems of the Foreign Currency System, but request any of the independent lateral Systems, they can be used along with the bank existing systems. Controlling the user access to system processes and their functions (generating, modifying, deleting and displaying information). Protecting the database servers against misuses and preventing unauthorized access to the system, by authenticating clients.